Man at the Gate offer premium LightSheer laser hair removal treatments and courses for men. Find out more online today. Our Lightsheer™ XC Laser Hair Removal provides easy, comfortable and permanent hair removal for the modern man. It makes waxing, tweezing and shaving a task of the past - there’s no need for hair removal to be time-consuming and inconvenient. Man at the Gate’s Lightsheer™ XC Laser Hair Removal machine targets the pigment in the hair follicle and shaft, causing faster light absorption and heat energy which halts hair growth and delays re-growth. In most cases our treatment delivers permanent destruction of hair follicles, which unlike electrolysis, reaches and treats hundreds of follicles at once. 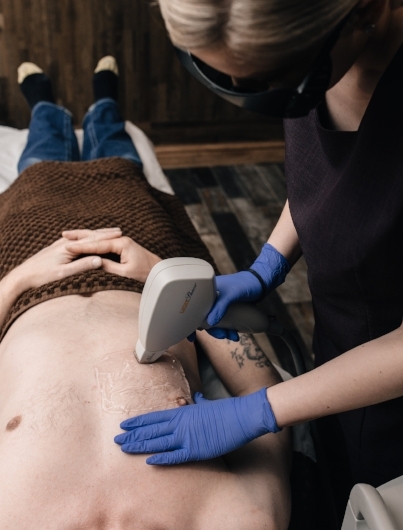 We recommend a course of treatments, ideally 4 to 8 weeks apart, so we can ensure all follicles are targeted during the hair growth phase.Ideally, you must allow a minimum of six sessions for the most effective hair removal. Please note that the treatment effect depends on the individual and the area of the body being targeted. Whilst changes are visible after only a few sessions, it is imperative that the whole course is completed for the best results. There are three phases in the hair growth cycle: growth, rest and transition. Hair can only be destroyed in the growth stage - our laser hair removal targets follicles at this stage. To effectively remove hair completely we must wait for resting hair follicles to re-enter the growth phase, before we repeat the treatment. There is very little, and most often zero, recovery time needed after our hair removal treatments, but you may experience some redness and mild sunburn sensations for up to 8 hours after treatments. We recommend that you refrain from using any heat treatments, such as saunas and direct sun exposure for 24 hours after your treatment, and that you use sun cream on any exposed areas. Hair will start to shed in the treated areas, which can be aided by gentle self-exfoliation. We usually expect hair to fall out around 2 weeks after your treatment, and whilst we expect hair growth during your course, the hair growth in the treated area will decrease over time with more treatments. It is safe to shave as usual alongside treatments, but we recommend no waxing. This will be redeemable against a course booked! Book your laser hair removal online now!